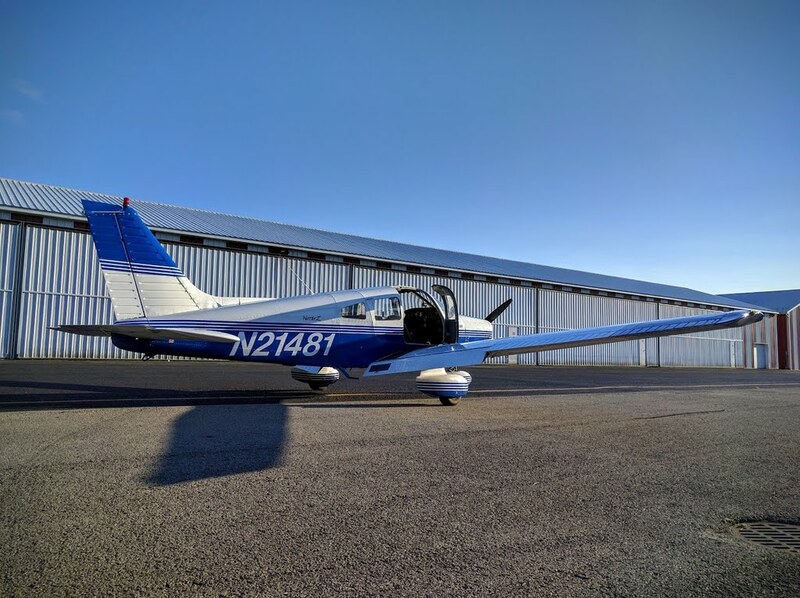 Smooth air, significantly reduced radio chatter, twinkling starlight overhead, and the ability to spot other airplanes miles away without effort - these are the wonderful benefits of night flying. Flying at night can be a joy, one of the most peaceful experiences a pilot can have. But if aviation is inherently unforgiving, nighttime conditions make it even more so. Risk of hitting deer lurking on a darkened runway or the challenges of selecting a suitable landing site in the event of an emergency increase dramatically. Though the risk of engine failure is generally statistically low, the consequences of one occurring at night can be dire. Hence, the old joke about how to manage an off-airport emergency landing at night: aim for the dark spot and, when close to the ground, flip on the landing light. If you don't like what you see, turn it off again. Ray tells a story about his mentor having a nighttime engine failure decades ago. He walked away from the forced landing and returned the next day to see that he'd missed a large oil storage tank by mere feet, disaster held at bay by a tenuous thread of pure, dumb, luck. Some pilots absolutely love night flying and indulge themselves whenever possible, taking comfort in the fact that adverse events are rare. Others have sworn it off entirely owing to the seriousness of the consequences should an unusual event occur. My comfort level lies somewhere in between. I will fly at night, but generally over known terrain. 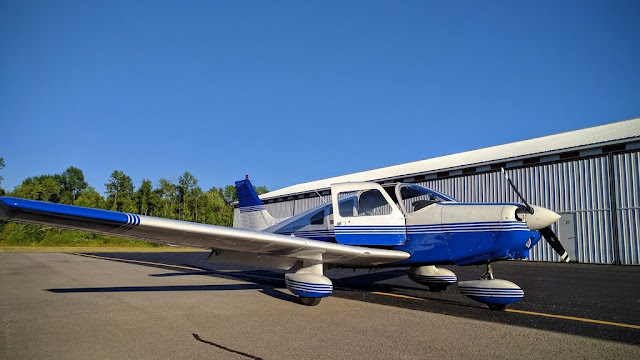 With few exceptions, this limits my nighttime flying to the relatively flat terrain between the Lake Ontario shore and the Finger Lakes, a region centered around the I-90 corridor between Buffalo and Syracuse. I also prefer excellent visibility on moonlit nights. Though instrument rated, my cockpit lighting is not terrific and night IFR has absolutely zero appeal for me. Though I have managed a cloud or two while en route, departing with the intention of nighttime IFR is outside my comfort level. In order to be legally current to carry passengers at night, a pilot needs to have conducted three take-offs and landings (full stop) at least one hour after sunset within 90 days. Though I do not fly often at night (I have logged 71.0 hours total, about 4.5% of my overall flight experience), I like to maintain night currency because it keeps my skills sharp and it provides flexibility should a flight with passengers return to the airport later than planned. As the days grow shorter with the approach of autumn, maintaining currency and proficiency at night becomes increasingly important. After a late evening session of pattern work, stalls, steep turns, and simulated engine out landings, the hour grew late enough that I decided to keep flying to extend my night currency. My home at the Williamson-Sodus Airport has an issue with deer, so I do most of my nighttime practice at other airports. 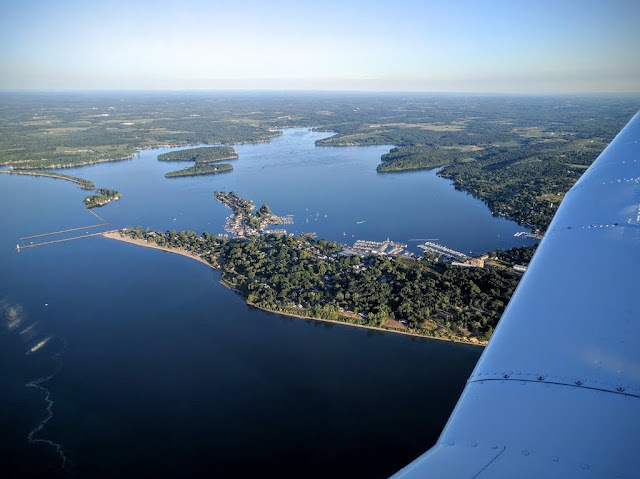 Sometimes, I do round-robin night flights: Oswego County Airport (FZY) to Finger Lakes Regional Airport (0G7) to Williamson-Sodus Airport. This time, I chose the Canandaigua Airport. It was nice to be there by choice for once, instead of under duress (see here, here, and most recently, here). As the glow of twilight faded, I waited on the taxiway for the elapsed time since sunset to exceed one hour. Another personal rule: I only do nighttime landings on runways with visual glideslope indicators. I did a lot of my nighttime training on runway 23 at Three Rivers (HAI) which did not have one. However, whereas Three Rives was in the middle of a cornfield with nothing to hit on the way down to the runway, many of the Upstate NY airports I fly to have terrain and trees lurking directly below the glide path and a little help staying on or above it is a good thing. With the mission accomplished, I departed for Williamson-Sodus in smooth nighttime air, enjoying the gift of night flight for a few minutes before being drawn back down by the lights of home. During post-flight inspection of the Warrior, I discovered that many insects gave their lives that evening for me to extend my night currency. I paid them silent tribute while removing their crunchy remains from the leading edges of my wings. Airplanes can inspire powerful nostalgia. Stories of military veterans tearing up in the presence of aircraft they flew decades prior are common, strong emotions inspired by reunion with the physical airplanes and all of their associated memories. I never fought for my country - or my own survival, for that matter - from the cockpit of a Corsair or Grumman 'Cat over the Pacific. Nonetheless, I hold a great deal of affection for a particular collection of vintage aircraft. From 2000 until early 2006, I volunteered at the Air Zoo in Kalamazoo, MI. There, I welcomed visitors into the museum as though it were my own home and told them about the wonderful aircraft on display. Each airplane was special in its own way, either because of its capability, the technological advancements it represented, or its prominence in a particular story. I would linger over each one, helping museum visitors understand how they were unique from one another, how they evolved over time, and how their form and function are so perfectly intertwined. They were much more than just "a bunch of old prop planes" and, if museum visitors walked away with even the slightest sense as to why, I felt that my mission was accomplished. Periodic visits to the museum in 2011 and 2013 revealed a steady evolution away from the purely aeronautical focus of the original Kalamazoo Aviation History Museum. "It's not what it was," is a common refrain that I hear from friends still there. That's true. What started as a hangar full of airworthy World War II warbirds has evolved into a multisensory science and technology museum with an aviation bent. Sadly, the airplanes no longer fly, though the skilled volunteers in the restoration facility continue their Smithsonian-caliber work. We returned to the Air Zoo on August 23, 2016 and were warmly welcomed in the main lobby by my former colleague, Tamra. The Bear knew exactly how to enter the museum properly. I trained her well many years ago. On entering, we were met by the F-14 Tomcat. Dispersed among the airplanes on the main exhibit floor were kiosks of the "POPnology" exhibit examining the influence of popular culture on technology. I was struck by how this exhibit seemed to relegate the airplanes to background objects. Yes, The Bear and I rode the balloon ride. She loves the balloon ride. 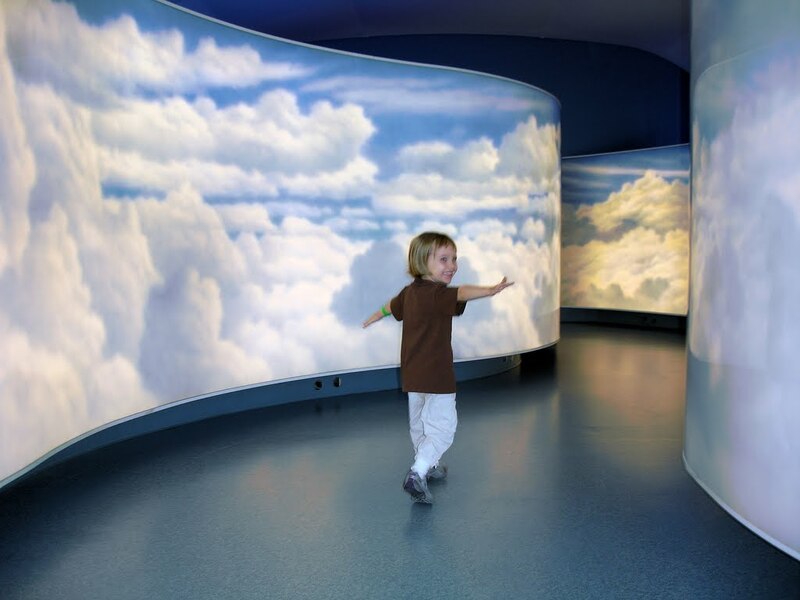 When the balloon ride (and other rides) opened in 2004, it marked the beginning of the museum's shift from "hangar of airplanes" to "family attraction". Despite this shift, the old elements still exist. While we rode the balloon ride, a docent stood with two museum visitors near the B25 talking about the airplanes much as I would have years ago. We left the main building for East Campus, which was the original museum facility where I first volunteered before the newer Main Campus building was constructed in 2004. This structure now serves as both aircraft display space and restoration facility. Wildcat raised from Lake Michigan, photographed 27 August 2013. On my last visit to the museum, the Air Zoo had just taken delivery of an FM-2 Wildcat raised from the bottom of Lake Michigan where it was lost during a carrier training exercise. A group of volunteers were actively working on a portion of the recovered fuselage. Unsolicited, one of them approached us and offered us a detailed update on the team's progress, explaining how they were attempting to use the aircraft's original parts wherever possible. Years in Lake Michigan had taken its toll on the many engine components fabricated from magnesium. For example, although steel components from the ship's supercharger were still in good condition, the magnesium shell of the device was not salvageable. Nearby, new ribs and stringers were being fused with the original structure of one of the wings. Air Zoo staff had made significant progress on the Wildcat since its arrival in 2013. When complete, the single engine fighter will be displayed at Chicago's Navy Pier. It was the Air Zoo's 1929 Ford AT-5 Trimotor, also known as the "Tin Goose", "Flying Barn Door", "Quanset Hut with Wings", or "Flying Washboard" (N8419). Once, this aircraft flew museum visitors on sightseeing excursions over Kalamazoo. Late in my time at the Air Zoo, serious corrosion was discovered in the center spar box and the old ship underwent an exhaustive restoration under the supervision of local Trimotor expert Maurice Hovius. While the airplane was off-line, I accumulated enough volunteer hours to earn a free ride, but it was not meant to be. Sometime after I relocated to New York, the Trimotor resumed flying for the Air Zoo and, more recently, went on tour under the EAA (Experimental Aircraft Association) banner. After that, I lost track of it. I identified myself as a former docent to a passing volunteer and asked about the status of the airplane. He assured me that the Ford was home to stay, but that it was "decommissioned" and no longer flying. My brow furrowed. "Decommissioned because of a mechanical issue or because of insurance costs?" "Insurance," confirmed the volunteer, a sour look on his face. It was the same reason that had gradually grounded the rest of the Air Zoo's fleet over the years. His expression told me that he felt the same way about it that I did. "Would you like to go inside? Sit in the cockpit?" offered the volunteer. Um...yeah! That is how, after years of leading tour groups to this iconic early passenger aircraft, I finally had my first opportunity at the left seat. The aisle was tight and the headroom significantly reduced where the wing spar passed through the top of the cabin. I inched my way up the narrow, inclined aisle to the cockpit. Much to my dismay, The Bear refused to join me. I carefully maneuvered into the left seat, avoiding an avionics rack on the floor containing some old radios that were nonetheless manufactured decades after the Ford originally emerged from its factory. As a result of having been built by Ford, the primary flight controls would have looked familiar to anyone with a driver's license. This is not to imply that anyone with a driver's license would know what to do with them, however. Though neither accompanied me inside, Kristy and The Bear climbed a nearby ladder to join me at the cockpit window. I was thrilled to sit in that seat and am grateful to the volunteer who offered me the opportunity. Given the status of the airplane, this may be as close as I ever come to getting that ride I've wanted for the last 15 years. Near the Trimotor was another new arrival: a Douglas SBD Dauntless dive bomber. Like the Wildcat, it was also recovered from the bottom of Lake Michigan. Its delivery to the museum for restoration occurred in July 2016. Though partially disassembled, this aircraft appeared to have survived its internment in the depths of Lake Michigan in far better condition than the Wildcat. "Analysis: Pilot had turned into the downwind leg of the landing circle when his engine quit. The preformance [sic] of the engine prior to coming to a dead stop, indicates "carburetor icing" as [unreadable] was a gradual loss of RPM and finally complete stopping. Board attributes 100% to pilot error of judgment. This pilot received instruction in the use of alternate air for icing conditions in the lecture by a qualified landing signal officer of this unit." The accident occurred 18 February 1944 at the hands of a pilot with 1633.5 hours of flight time (a little more than I have now). Carburetor icing is something that all pilots know about, including very low time students. This would seem to give some insight into the challenges and stresses involved in carrier training. Next to the fuselage, the Dauntless' engine appeared to be in excellent condition. This restored MiG-21 was always one of my favorites at the museum. For many years, it was not on public display and I was glad to see it available once more. One of the most successful singe engine fighters of World War II, the North American P-51 Mustang, had this engine at its heart: a Rolls-Royce designed Merlin. This particular example was built under license by Continental Motors in nearby Muskegon, MI. Back at Main Campus, we perused newer additions and some old favorites. A Heath Baby Bullet kit airplane. A Hispano HA-112 (based on the German Bf-109) and Republic P-47 Thunderbolt. R-2800 powerplant of Republic P-47 Thunderbolt. Nearly hidden by the POPnology kiosks, away from the crowds and excited children, lay the entrance to a little bubble of the museum as it once was. Another hangar on the back of the Main Campus building contains much of the core collection of the museum as it existed when I became involved with the Air Zoo in 2000. It includes another Douglas SBD Dauntless recovered from Lake Michigan, the restoration of which put the Air Zoo on the map with respect to its ability to rejuvenate wrecked vintage aircraft. This FM-2 Wildcat is an example of how the single engine fighter in the restoration facility raised from the lake will look when complete. This particular fighter was airworthy at the time of its consignment to static display. The Air Zoo's Corsair was once a mainstay of the annual "High on Kalamazoo" airshows of the 1980s and 90s. The formidable Grumman F6F Hellcat, like its Wildcat forebear, once also actively flew for the museum. I researched this aircraft extensively as a part of my docent training many years ago. Standing before the Hellcat in the museum's World War II gallery, I was overwhelmed by wistful nostalgia. This was MY airplane. In a way, every one of them was mine after years spent telling their stories and highlighting small details for museum guests. But I was attached to the Hellcat in particular. In my day, they all stood proudly in the East Campus hangar, oil pans strategically positioned underneath to catch fluids as the aircraft slumbered in anticipation of their next adventure aloft. The oil pans are gone now and the engines are pickled with no intention of being flown again. I stood alone with my airplanes, removed mere tens of feet from where families crowded around the POPnology exhibits and children shouted with delight. These proud old birds felt lonely and bereft in the quiet hall. But at least they are still there, concrete reminders of the facility that was and safely preserved for the ages. With the many distractions from aviation history in the museum, the Air Zoo felt like a different place. By diversifying its scope away from the airplane niche, perhaps the Air Zoo is better positioned to survive and, if so, then that is a wonderful thing. Fortunately, bubbles of the old museum still exist - the airplanes, the docents with their stories, the restoration center - and they are available to whomever enters in search of them. While I ruminated in the quiet World War II hangar, The Bear was back to enjoying the balloon ride with her best friend in the main exhibit space. If the balloon ride or POPnology draws people in, that's OK. Maybe some of them might come to see the old airplanes for what they really are and be inspired by their stories. In that remembrance, they will fly again without ever leaving the ground. Perhaps the only invention more effective at shrinking the world than the airplane is the Internet. Through blogging, I've made many friends in the aviation community that I would have not encountered otherwise. I've been fortunate to meet some of these terrific people in real life; enabled, of course, by our common passion for flight. These real life meet-ups have included fellow bloggers Gary, Jeff, Steve, Victoria (along with Turbo the Flying Dog) and frequent reader Ed. I first encountered Jeff on the Piper Owner Society forums where I was active during my early years of Warrior ownership. When we met in person for the first time over lunch near Richmond, VA, it was like greeting an old friend from high school. Since meeting Gary, I now "hear" his distinctive vocal timbre and cadence whenever I read his blog posts. After a lunch together in Frederick, MD, Victoria became my aviation insurance agent. Despite the fact that we all live in different places, Steve, Jeff, Victoria, and I all trace our roots back to southeastern Michigan. Whereas Victoria and I share a common home town (though we did not live there concurrently), Steve, Jeff, and I all spent a period of our lives in Kalamazoo. We share many things in common, but it was aviation - and the Internet - that brought us together and sparked our friendships. The first time Steve and I met in person, he surprised me with a supply of Bells' Oberon that he airlifted directly into the Williamson-Sodus Airport by Cessna. At the time, this favorite brew from Kalamazoo was unavailable in New York and I appreciated not only his thoughtfulness, but his clever use of an airplane as a beer delivery vehicle. Though business travel brought Steve back to Rochester several times since, a visit in August 2016 finally coincided with good weather and sufficient time to capitalize on it. Though Steve was already very familiar with my airplane from years of reading this blog, it was his first time actually laying eyes on it in all its Spam-canny glory. Steve has a great eye for photography and he put it to work as we prepared to fly. Aloft, I flew Steve over the Lake Ontario shore to share one of my favorite local sightseeing destinations with him: Chimney Bluffs. Though Steve had flown to Sodus previously, Chimney Bluffs is the kind of unique ground feature that is easily missed by those unaware of its existence. The Bluffs were practically glowing in the late evening sunlight. I passed control to Steve and pointed him toward the north end of Canandaigua Lake. Steve flew us southward along the middle of Canandaigua Lake and followed the valley westward on a scenic run to Dansville for dinner. On the downwind portion of the traffic pattern at Dansville, we found ourselves wingtip to wingtip with another Cherokee flying a much wider pattern than we were, which is quite a trick considering the nearby high terrain. It's always a little awkward when you're already established in the pattern, making all your radio calls, and another aircraft arrives, maneuvering in a way suggesting that its pilot neither saw nor heard you. Despite the fact that he was close enough for us to read his tail number, my "do you have the Warrior on downwind?" query over the radio was met with befuddlement. He obliged us by extending his downwind while we turned in to land. 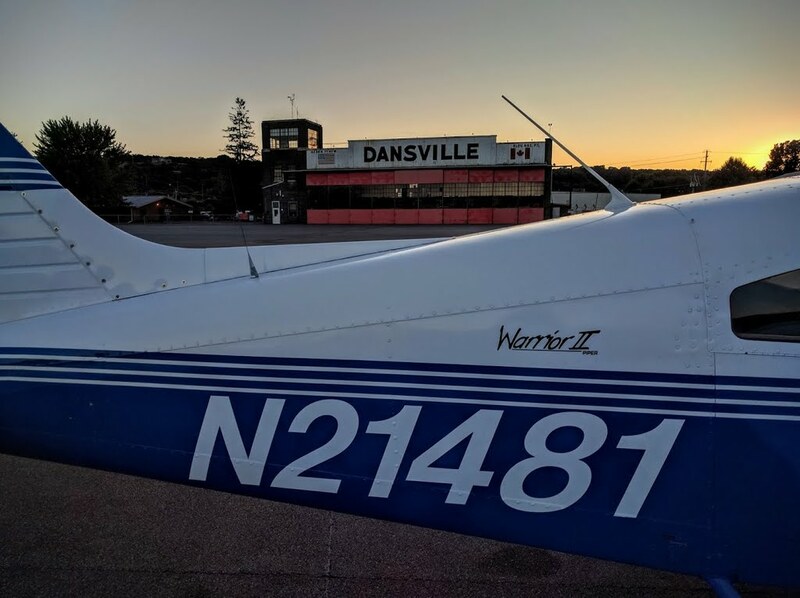 From the Dansville airport, the best dining option within a short walk is a local truck stop. It is not the fanciest of dining destinations, but their fare is more than adequate. Over dinner (which was actually breakfast in my case), Steve and I talked about flying, travel, and the vagaries of corporate life. The flight home was conducted well after dark. We passed through some unexpected updrafts in the dark, causing me to recall my recent unpleasant nighttime experience with aggressively rising air. We both picked up the rotating beacon at Sodus from several miles out, but it seemed that we were only seeing the green light. Once on the ground, we were baffled to see obvious diametrically opposed green and white lights on the beacon. Considering that we both saw this, I think it officially counts as a mass hallucination. It was a beautiful night for flying and I was glad to be able to share it with an old friend from my digital community. The good friends that I have made through this blog have been one of the best, and most unexpected, benefits of sharing my thoughts and experiences with the world.